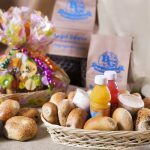 Fresh baked, genuine Bagel Grove Bagels, arranged and wrapped in a wicker basket – packed with all the fixin’s to make a complete gift. Gift Card available for no extra charge. 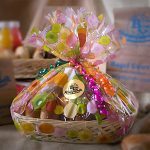 Local delivery* available – Seven Days/Week! Looking to have your order shipped* outside our delivery area? 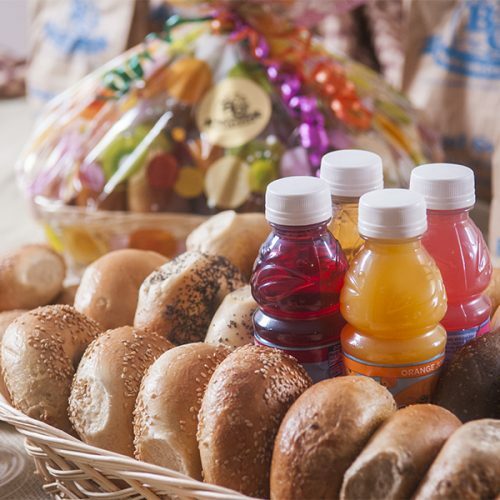 *If you would like to ship a bagel basket outside our delivery area please click on the we deliver link and read through the instructions before placing your order. Select an option... Festive – Multi Colored Circles Festive – Grapes on a Vine Sympathy – Deep Purple Birthday – Mulit Colored Stars Wedding – White Dots Teacher Appreciation – Apples Graduation – Caps & Diplomas New Baby – Bottles & Rattles Anniversary – Silver and Gold Anniversary – Gold Dots Valentine’s Day – Hearts St. Patrick’s Day – Shamrocks Easter – Pastel Eggs Thanksgiving/ Fall – Autumn Leaves Halloween – Witches Hats and Brooms Christmas – Red & Green Wreaths Hanukkah – Stars of David White Lilies – SM & MED ONLY! Baby Footprints – SM & MED ONLY! BOO & Bats – SM & MED ONLY!